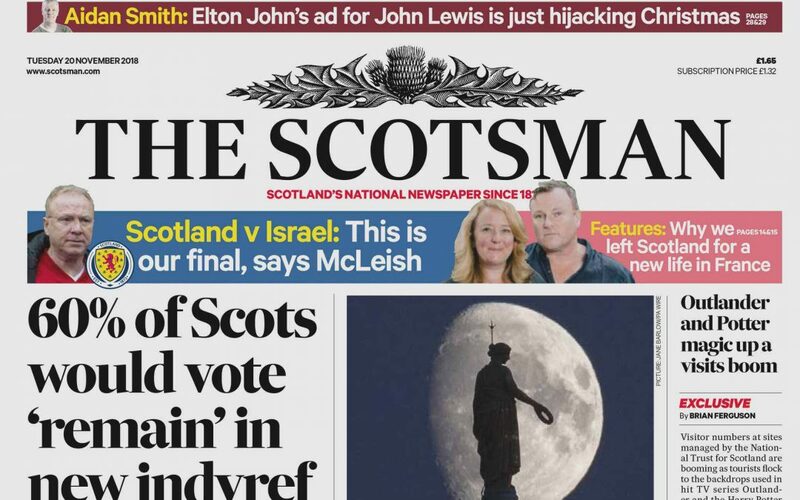 If you managed to see past the attention grabbing headlines about how the majority of Scots would vote ‘remain’ if there was to be a new indyref, or about the vast number of visitors flocking to see the Outlander and Harry Potter sets at National Trust sites… you might just have noticed two familiar faces on Tuesday’s THE SCOTSMAN front cover. Speedily flicking through to pages 14 and 15 (as I’m sure you would have) you’ll have found our wee article, which gives just a glimpse of the journey we have been on over the past three years. Read the article in full here or download a PDF here. People often ask us why we moved from East Lothian to South West France. Is it so that you can live as if you are on holiday for nine months of the year, because the climate is so lovely you can eat dinner al fresco? Is it because there are fairytale chateaux dotted in amongst rolling sunflower fields from whom you can buy delicious wine directly for under a fiver? To be honest, it was for neither of these reasons, it was so that my husband and I, two self-employed first time buyers, could buy a house that we actually wanted to live in! Two and a half years ago we were renting a three-bedroom cottage just outside Haddington. It was lovely, but we wanted to invest in our own home. We soon noticed how much more you could get for your money in France than around Edinburgh and we were hooked on the idea. We are both ambitious creative’s. Colin is a Photographer and Digital Media expert and I’m an Artist and Web Designer. How could we continue to build our careers, to meet and work with likeminded clients, to guarantee enough income to pay a mortgage, in a foreign country with a foreign language? Again, it was all about the house. We needed to find a building not only for us to live in, but a property that we could use to build our dream jobs. Mine, to run an arts centre, offering creative residencies, cultural events, exhibitions and workshops, and Colin’s, to be a photographer, filmmaker and photography teacher. We would call it Studio Faire. After narrowing down our search area, we started looking in earnest. To be honest we would never have found ‘the one’ without the assistance of Estate Agent Caroline Hubbard (Leggett). We wondered what on earth she was playing at when she walked us through the door of a small mansion. It was stunning, but way over budget! I felt disgruntled as I walked through huge room after huge room, past marble fireplaces and high skirting boards, through vast outbuildings to the stunning ‘parkland’ garden. Why would she show us this ideal property, which she knew we couldn’t afford? She had a plan. We did not need to purchase all of the land. We could keep enough for a lovely big garden, plus a bit more as an extra buffer and knock 120,000€ off the price. It was late summer 2016. You remember? The summer of the Brexit referendum! Our budget was always going to be tight, but now, as we watched our sterling deposit weaken against the euro and received rejections from four banks to our mortgage applications, our dreams began to crumble. We had come such a long way down this path, now living and renting in France, having found this amazing dream property just bursting with potential that we knew we could afford to buy, we had to find a solution. We decided to employ the assistance of a broker. After describing our situation to them they scratched their heads but agreed to take on the challenge. Autumn and winter passed in silence. We were well into February when the call came. It was good news. We had a mortgage! We finally moved in on March 30, 2017. Our aim in the first year was to focus on making the property work both as a home for us and as a place where all types of creative practitioner could come and stay to work on personal projects. It was important for us to have our own private space to sleep, relax and wash. So, first things first, we decided to add an en suite to our bedroom. There was already a sink in a small room just off the master bedroom and all we needed was the addition of a shower, as there was already a toilet on the landing. Should be simple, right? One morning, as Colin drank his coffee in the garden, he wondered why he could smell toothpaste. It was only then that he noticed that the sink in question was draining straight out onto the grass! We also discovered that it only had cold water and the boiler was miles away!!! Nothing about getting the plumbing working in this huge house was simple. Two toilets, two sinks, one shower and three water heaters later (Three? Don’t ask. ), somehow we managed to get it all working in time to open our doors to our first residents in the spring of 2018. Somehow we managed to get it all working in time to open our doors to our first residents in the spring of 2018. Zoom forward 6 months and we have already welcomed a total of 14 residents! We have had the absolute pleasure of meeting an African American Choreographer, an Icelandic Composer, a Palestinian Printmaker, an Irish Illustrator, an English Poet and (of course) a fair few Scottish Artists and Designers. With local history in abundance, the best weekly market in the area, a riverside walk and sprawling surrounding countryside, several nice bars and restaurants to hang out in and much more, we now know for certain that our chosen town of Nérac is an ideal location for creative folk to fill their boots with inspiration. La Cigale, the local artisanal chocolaterie that inspired the novel (and later film) ‘Chocolat’ by Joanne Harris was what particularly caught the eye of Scottish Ceramicist, Rebecca Wilson, whereas for Scottish Printmaker Sarah Gittins, it was the plum orchards internationally famed for their pruneaux d’Agen. Not everyone is inspired by food though and it’s been extremely fascinating to get to know these people and find out what gets their individual creative juices bubbling. We have not only been focused on our renovations and residents though, as we have also set up a photography studio in which to fulfil Colin’s aspirations. Colin specialises in portraiture and giving over our largest room (affectionately nicknamed ‘The Usher Hall’) to be his studio has been fully justified through a multitude of professional headshots for the likes of French Author Jean-Christophe Brisard. Colin has an incredible talent for drawing out people’s character in his photographs. Our dogs like to help the sitter relax also and can usually be found lounging around in the midst of the activity waiting for an opportunity to grab a bit of attention. We have launched a Photography School and Colin has now taught over twenty students. We plan to start running residential courses from spring next year so that we can combine the residencies with the teaching to offer an amazingly fulfilling holiday experience. While we continue to build on these initial foundations of Studio Faire, we’ll carry on doing whatever we can think of to make ends meet. Since emigrating, work to date has included: graphic design, web design, teaching English, gardening, decorating, copywriting and making films with a camera drone. The French say we are like Swiss Army knives, multifunctional! Seeing creativity blossom in and around this fantastic property, just as we dreamed it would, has proved to us that what we have been striving for is worthwhile and fulfilling! It’s been far from plain sailing so far and we know that there will no doubt be more challenges ahead… but it’s certainly an exciting adventure. Sarah Gittins was a guest this summer, above. Would you like to be one of our residents?